In the past, when I thought of people who ate a “healthy” plant-based diet, I assumed that their life consisted of lots and lots of salad. But one thing I discovered very quickly when I completely changed the way I eat one year ago is that I do not like eating salad. I don’t really enjoy eating cold food, in general. I especially don’t like eating a bowl full of cold, crunchy lettuce. Salad has even made me cry a few times. In fact, the only time I DO like eating salad is when it’s topped with something warm, like taco meat. I don’t eat most salad dressings or croutons or cheese, which are all of the things that WOULD make a salad bearable. So, what’s a girl to do when she is trying to eat one to two pounds of veggies every day? What’s a girl to do when she loves warm comfort foods? How does she go from waking up most mornings to a piping hot bowl of oatmeal to trying to figure out how to make veggies feel like breakfast? Well, it’s taken me most of the year to answer these questions, but I’ve finally discovered the golden ticket. SOUP! Soup makes an amazing breakfast, lunch or dinner. It can be warm and creamy to fill that need for comfort food. And when you make it with lots of veggies, it’s packed with flavor and nutrition. Think about it this way. It’s perfectly normal to throw a bunch of fruits and vegetables in a blender with liquid and eat a smoothie for breakfast. Soup is basically the same concept, but it’s hot. We can just call it a hot smoothie if that makes it more appealing. The last few months, I got my soup making down to a science, so I thought I would share my formula. I usually make several soups a week and store them in the freezer in mason jars. This makes it super easy to grab one when I’m headed to work or any place food will be served (since I usually have to bring my own food). Another crazy thing that has happened to me in the past year is that I get “cravings” for foods I’ve never eaten before. 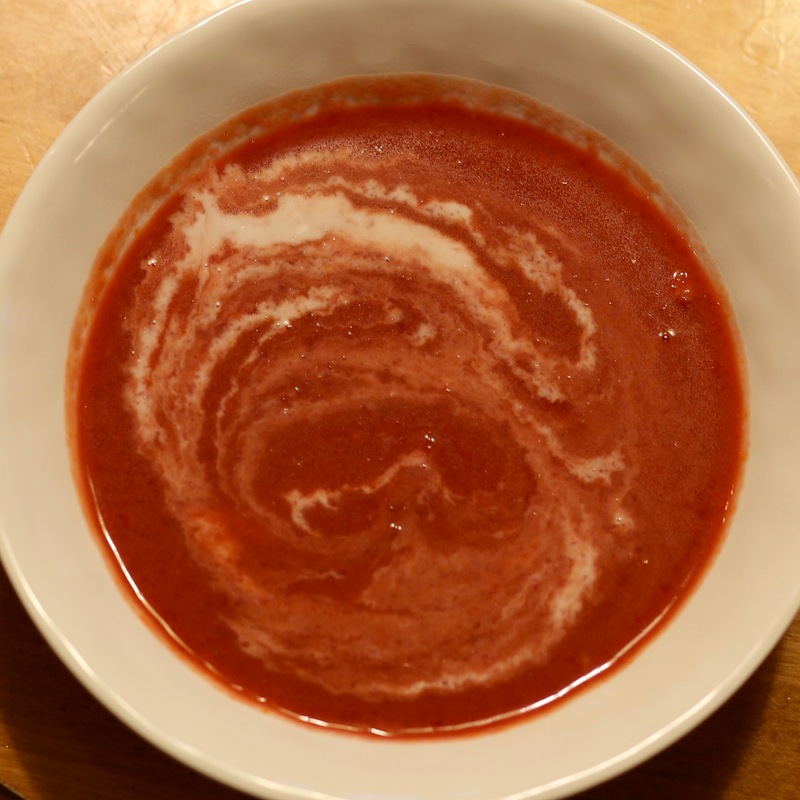 Recently, I knew without a doubt that I MUST have some beet soup ASAP even though I wasn’t even sure if beet soup was a real thing. 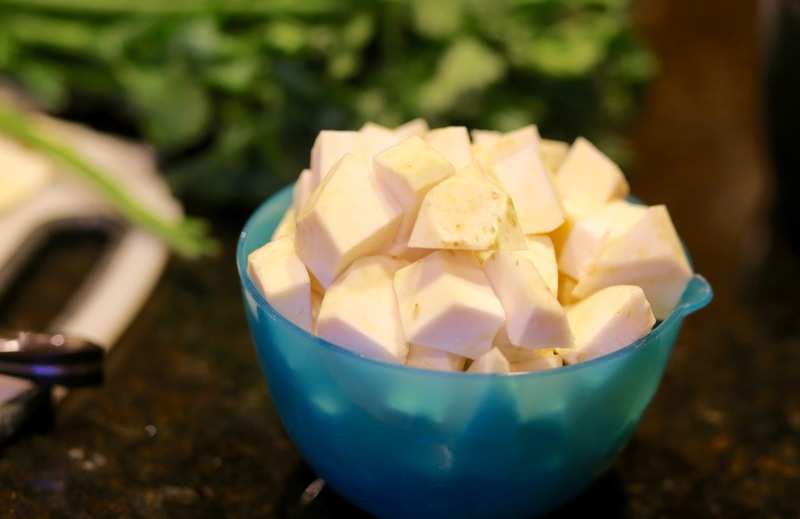 I’ve loaded my cart at various times with lots of little-known fruits and veggies: jack fruit, jicama, delicata squash, plantains, parsnips and white yams, to name a few. 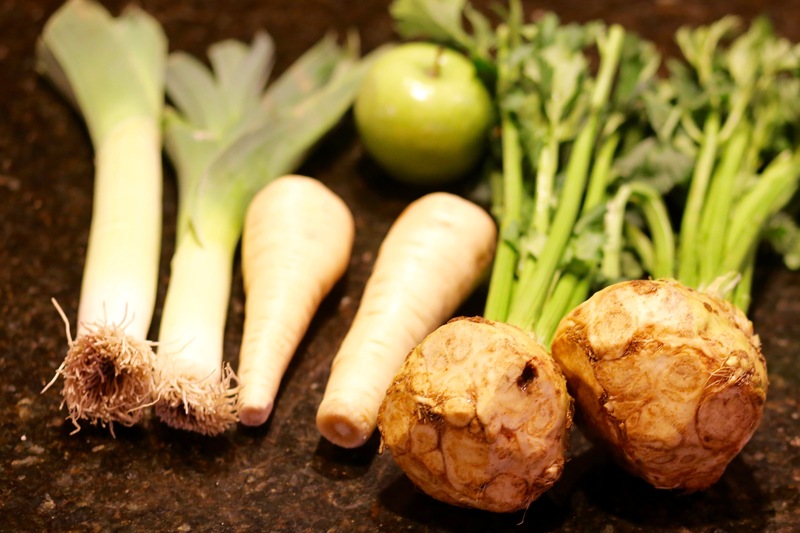 This week, the same thing happened, but this time with Celeriac (also known as celery root). I have not ever in my life eaten celery root, and yet it seemed to be calling to me from the produce section. 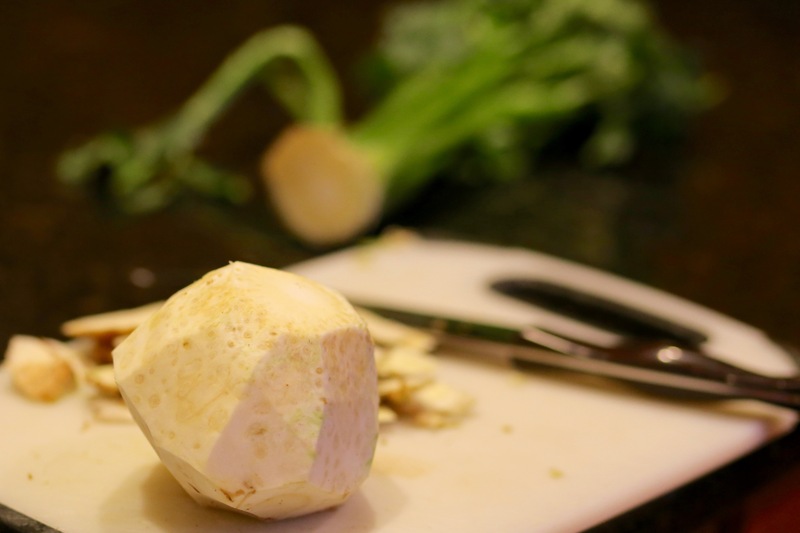 Celery root is delicious, by the way. 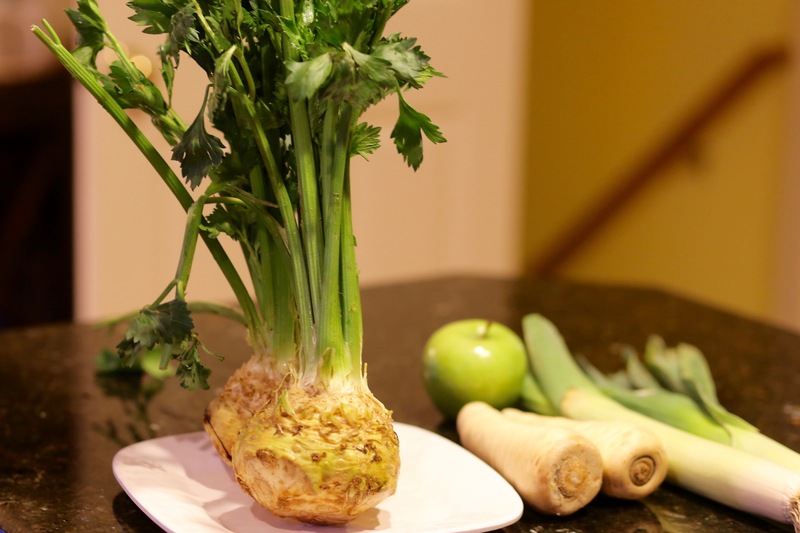 It has the tang of celery, but the crisp, starchy consistency of a potato. 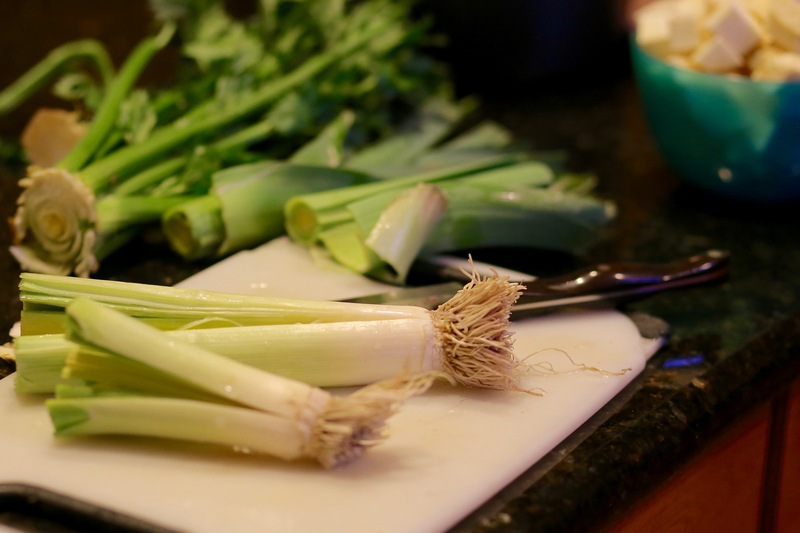 So, I will share my soup making formula, using celery root soup as an example. This method applies to any “cream” soup since those are my favorite and feel most like breakfast to me. Step 1: I always start with one 32 ounce container of chicken stock. I buy mine at Costco because it’s gluten free and has the best ingredients of any I’ve found. Pour this in your electric pressure cooker. Step 3: Cook for 18 minutes. My pressure cooker has a “soup” setting, so I press this button and then adjust the time to 18 minutes. Why 18 minutes and not 15 or 20? I have no idea. I just made up the time. But trust me. It works. Allow the steam to naturally release. Step 4: Put the cooked veggie mixture in the blender. Puree until smooth. 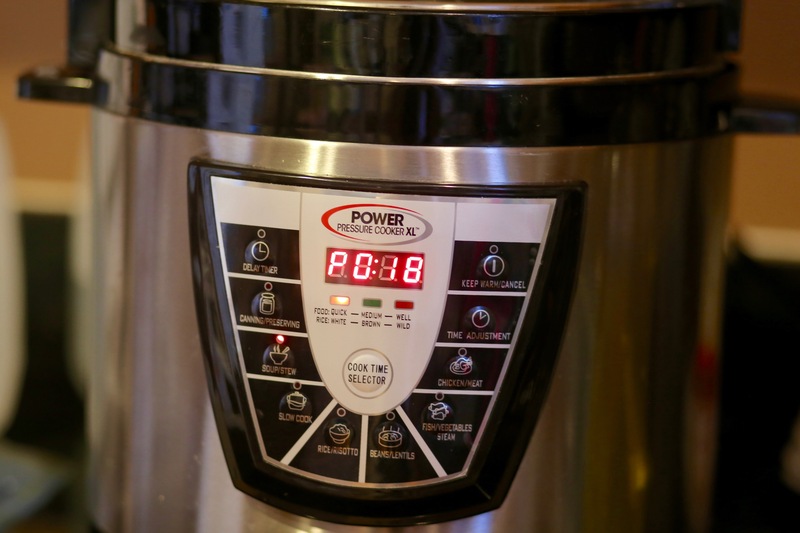 Step 5: Return everything to the pressure cooker. 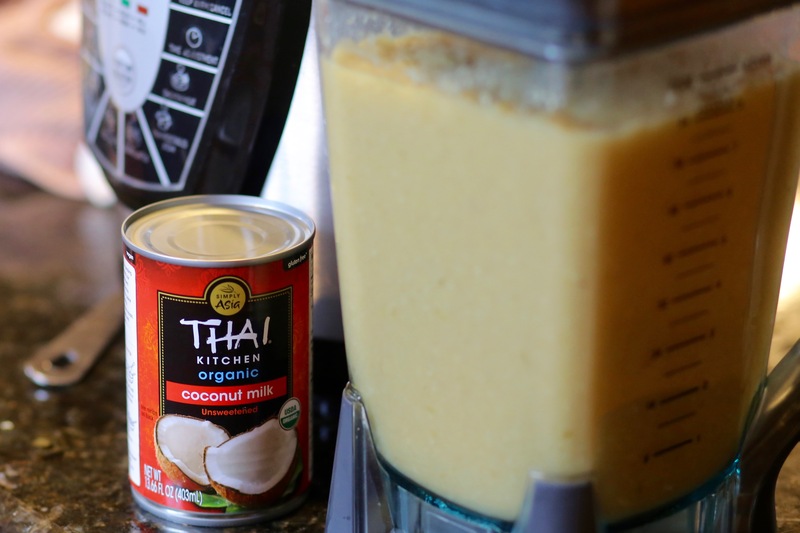 Stir in one cup of full fat coconut milk. I’ve done this in tons of different variations. I’ve also done this with two heads of broccoli, which is amazing. And I’ve just randomly thrown in a selection of whatever veggies I have on hand. You really can’t go wrong! Add a sweet potato if you want the soup to be sweet. Add cauliflower to make it more creamy. 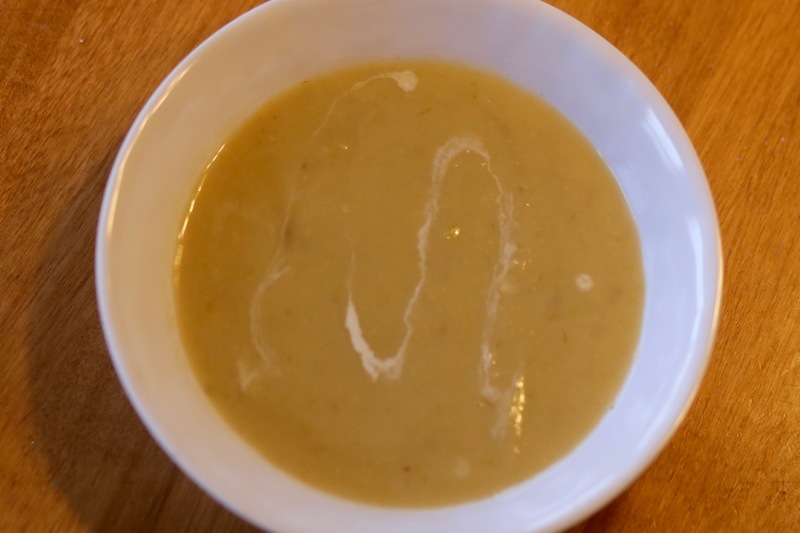 Oh… so I should give you the verdict on the celery root soup. 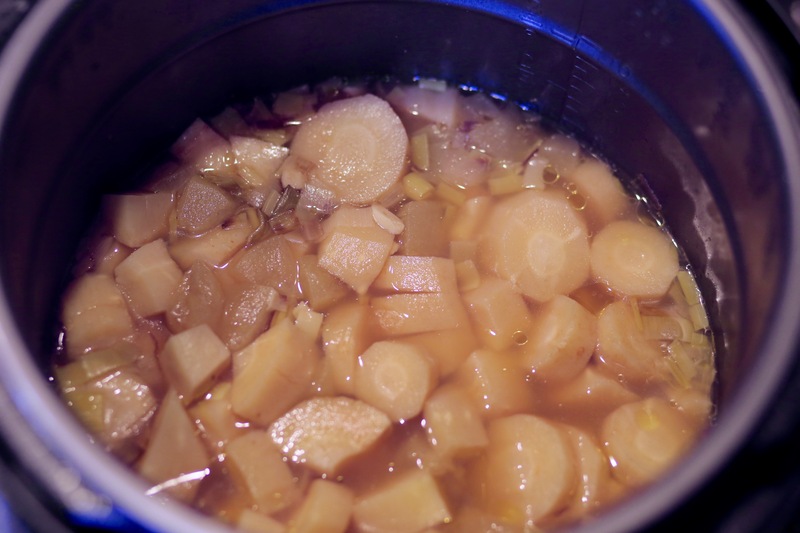 I feel like the parsnips overwhelmed the celery root in this batch. I think I’ll try again next time with carrots instead of parsnips or maybe a sweet potato. I really love any type of cream soup, so I enjoyed it. But just a warning that the parsnips have a very strong flavor! I would love to hear from you. Do you love soup? Do you like salad? 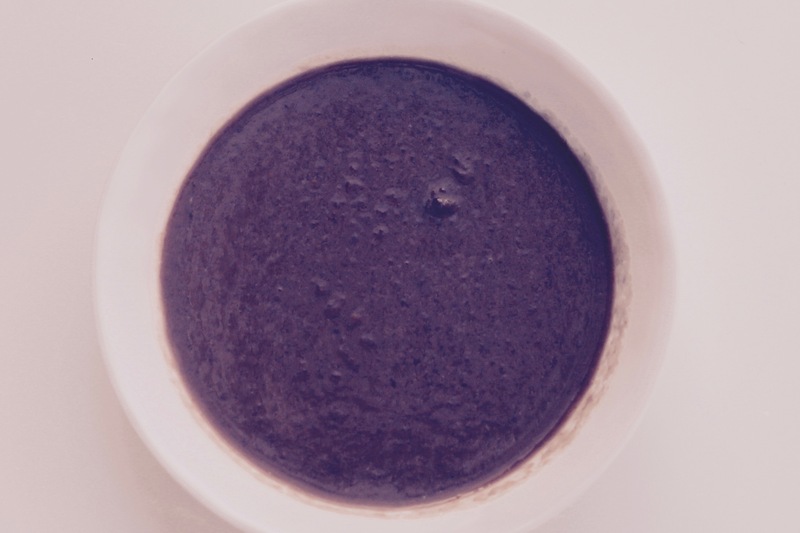 Could you eat soup for breakfast? Next Post Next post: Winter decorating with… pompoms? Curious, eating so many fruits and vegetables would you say you hav a high fiber intake? Trying to learn how to limit fiber, I know silly, but still needed. Beth, that’s a really good question. I don’t even think about fiber. I’m mainly focused on getting a wide range of nutrients. I also make sure to eat plenty of fat to keep me fueled. The one thing I try not to go overboard on is starchy vegetables. I do need some to give me enough energy, but if I eat too much starch, I will feel it. I’m assuming too much fiber causes digestive distress? In all of the health materials that I read and listen to, I don’t ever hear anyone talk about fiber! Maybe I should learn more about it to determine if I should pay more attention! You are amazing ! I could probably eat soup for breakfast.